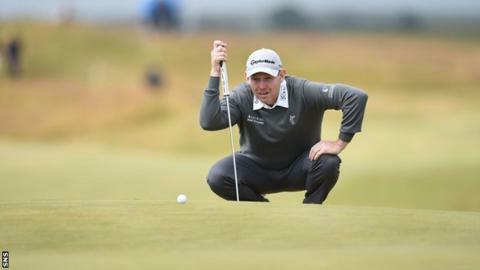 Paul Lawrie says the Gleneagles course "sets up better for a Stephen Gallacher than it does for a Luke Donald"
Ryder Cup veteran Paul Lawrie feels fellow Scot Stephen Gallacher "deserves" a place in the European team at Gleneagles next month. Gallacher, 39, can earn an automatic place in Paul McGinley's team by finishing in the top two at this weekend's Italian Open. However, he could also become one of McGinley's three captain's picks. "Stevie and I have had a couple of conversations and he's had a hell of a year," Lawrie told BBC Radio Scotland. "If he gets in, he'll just have the best week of his life. It's the best tournament there is in golf, there's no question about that. "Ian Poulter, Lee Westwood and Stephen Gallacher would be the three that people are talking about. "I'm not sure the course suits Luke Donald all that much but, again, he's hugely experienced. He's been a world number one, it would be harsh to leave him out. "For me, I think the course sets up better for a Stephen Gallacher than it does for a Luke Donald." Lawrie says there are other contenders for wildcards besides Gallacher, Poulter, Westwood and Donald. "Francesco Molinari's played the last two Ryder Cups, he's great in foursomes," said Lawrie. "Jimenez is just Jimenez. He's a pretty cool dude, he's got experience. Who's to say he might not throw Miguel Angel into the mix?" Should Gallacher play at Gleneagles, it will be his first Ryder Cup. "Picking a rookie's pretty tough but Paul McGinley gave himself one extra pick," explained Lawrie. "When you're picking three players, it gives you a little bit more leeway to pick a rookie. If you've got two picks and one of those is a rookie, that's a big call. "When there's three players in there, and let's say he goes with two experienced players, I don't have a problem with the third pick being a rookie. "I think that's why he's done it, he wanted room in there for someone who maybe either hasn't played before or a Scottish player in form. I assume that was the way he went." And Lawrie described Poulter as the man who "loves the Ryder Cup like no other current player". The Englishman played a crucial role in Europe's victory at Medinah two years ago. "I don't think you can leave him out," added Lawrie. Paul Lawrie was speaking on BBC Radio Scotland's Sport Nation.